To support Fire Door Safety Week’s campaign to banish the dangerous fire door wedge forever, Fireco is giving away 10 Dorgard SmartSounds. The #ClickItKickIt campaign asks people that have spotted a wedged open fire door to click it (take a picture) and then kick it (remove the wedge). We’ll announce the winners on Twitter or notify you by email. Dorgard SmartSound holds your fire doors open legally and safely, releasing them to close when the fire alarm sounds. It has improved noise recognition with SmartSound technology, so can distinguish between your fire alarm and common background noises, such as vacuum cleaners. Legally holding your fire door open protects it from damage and prolongs its life. As the door is automatically released when the alarm sounds, the spread of fire and smoke is prevented. Fire Door Safety Week runs from the 24th to the 30th September 2018. It raises awareness of the critical role of fire doors, particularly of the importance of good installation and maintenance. Building owners and users should check the operation and condition of their fire doors and report those that are unsatisfactory. Click here for more information on Fire Door Safety Week. What has the fire at Notre-Dame taught us? 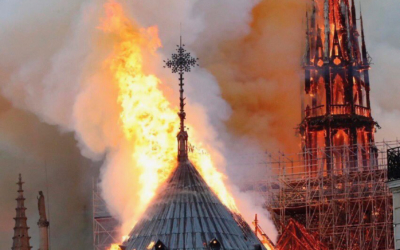 With the recent fire that broke out at Notre-Dame in Paris, there has been a lot of discussion about how best to deal with fires in historic or listed buildings. This blog covers some of the ways fire can be dealt with in these types of buildings. How do fire doors affect the lives of care home residents? 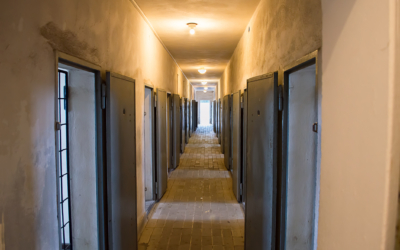 Why is compartmentation so important? It takes seconds for a fire to spread through a hole the size of a pen nib. Compartmentation is a way to keep a fire contained in one place, preventing fire and smoke from spreading quickly and taking over the building. Visiting customers over the past few weeks, something that has come up in conversation is the problem of residents damaging or disabling fire door closers. This is not only a safety issue, it invalidates insurance and can lead to big fines for non-compliance with fire regulations. In sheltered housing, many front doors are fire doors and therefore fitted with door closers. This ensures the door will be closed in the event of a fire, and the spread of fire and smoke will be prevented. Residents will then have more time to evacuate safely, or can remain in a fire safe compartment until the emergency services arrive. This is particularly important in sheltered accommodation as older residents may have slower reaction times when the fire alarm sounds. Those that have mobility issues will take longer to evacuate. However self-closing fire doors are heavy and difficult to open. Residents may find it difficult to get in and out of their flats. The frustration of struggling to open their front door has led some residents to break or disengage door closers. Though understandable, this is dangerous and against fire regulations. If a fire does break out, an open fire door will cause fire and smoke to spread rapidly, putting residents at risk. To solve this problem, councils often install unnecessary, expensive automatic door operators for these residents to use. A much cheaper option is Freedor. Freedor is a free-swing door closer that takes the weight and closing force out of fire doors. It has built-in technology to automatically close the door when the fire alarm sounds. It’s fully compliant with fire regulations and solves the problem of residents disabling door closers. As Freedor has removed the weight and closing force of the fire door, all the stress of dealing with fire doors has been removed, and residents can come and go as they please. Freedor is wireless, so can quickly and easily be fitted to existing sheltered housing units. A key advantage with the wireless systems is the lack of disruption. Freedor can be fitted with residents still in their flats, with minimal restorative works to walls and doors required. Freedor also safely and legally holds fire doors open at any angle, so if a resident wishes to have their door open, they can. It’s important that sheltered housing residents do not have their quality of life impeded by the need for fire safety. Fitting Freedor offers them the freedom to live their lives as they wish, without worry. Sheltered housing residents sometimes damage or disable fire door closers to make them easier to open. This is unsafe and against fire regulations. What is the solution? There are many challenges to managing fire safety in a care home. Our Fireco guide offers advice to simplify safety and easily stay compliant with fire regulations. It’s time for part five of our fun Friday fire quiz! Ignite your passion for facts! Incinerate the competition by getting full marks first time. Let’s get started! You keep striking that match but it won’t light! Try again! You lit the match! But then the wind blew it out. Try again! You’ve lit your match and all 80 of the candles for your grandma’s birthday cake. You are a flamin’ genius! Well done. Approximately how many homes were destroyed by the Great Fire of London in 1666? Which band released an album called A New Flame in 1989? On which part of your body would you traditionally wear hose? According to Fire and Rescue statistics, what was the most common cause of accidental fire in non-dwelling properties in 2017/18? A candle flame generally burns at what temperature (on average)? If you really hit it off with someone, you are said to get on like a what on fire? Which brand of crisp has a flavour called ‘chilli heatwave’? Which pop song starts with the lyrics ‘Fire in the disco, fire in the Taco Bell’? In which year was the portable fire extinguisher invented? If you’re attracted to someone or something you’re said to be like a what to a flame? In honour of Bonfire Night, test your knowledge with our fun-themed quiz. Will you blow away the competition by scoring top marks? Happy Halloween! Test your knowledge of Halloween related trivia with our monstrous quiz! Fire wardens have an important role to play in any business. They’re not only responsible for helping people evacuate during a fire drill, they also assist in emergency procedure planning and fire prevention. In 2017-18 there were 11,141 accidental fires in non-domestic properties. Most fires are preventable, and fire wardens have a part to play in day-to-day fire safety, checking for any fire hazards or risks. Have you been given the role of fire warden? Our handy checklist will give you the rundown of everything you need to know. What are the duties of a fire warden in the workplace? In any business, the person known as the Responsible Person has legal responsibility for fire safety. The Responsible Person is usually the employer and can assign fire safety duties to other people, including fire wardens. Regularly revisit the fire risk assessment in case it needs updating. Even if you’re not responsible for completing the fire risk assessment, it’s important to keep these steps in mind when considering fire safety in your building. Our blog has more detailed information about fire risk assessments. How many fire wardens do we need? It’s important to remember that all shifts must be adequately covered, so you may have to nominate additional fire wardens to ensure there are enough for each shift. For higher risk premises, such as care homes, more fire wardens are required. Specific details are available in our care home fire safety blog. Fire wardens have an important role to play. They’re not only responsible for helping people evacuate during a fire drill, they also assist in emergency procedure planning and fire prevention. Most fires are preventable. It’s important to explore the most common causes of fire so that the appropriate prevention measures can be put in place. For a fire to start it needs a source of ignition, a source of fuel and a source of oxygen. For example, if a smoker falls asleep with a cigarette still lit, and sets fire to the sofa, the cigarette is the source of ignition, the material on the sofa is the source of fuel and the air is the source of oxygen. Unchecked, this fire will spread quickly. To prevent fire, sources of ignition, fuel and oxygen need to be kept apart as much as possible. Obviously this is difficult for oxygen, as it is in the air all around us, but it’s important to always think carefully about what possible sources of ignition are in your building, as well as thinking about what will allow a fire to spread once it has been ignited. Damaged wiring can overheat and cause sparks. If you spot frayed wiring or overloaded sockets, these need to be replaced/removed. It’s important that appliances are regularly checked by an electrician. Annual portable appliance testing (PAT) needs to be done. Replace any faulty equipment and keep an eye out for any product recalls. Regular servicing of all electricity and gas appliances is essential. Make sure everything works correctly, and if not you’ll need to replace with new and safe appliances. Make sure any repair work is carried out by a qualified heating engineer or electrician. Any spills must be cleaned thoroughly, particularly if hot work takes place in your workplace. Switch off electrical equipment when not in use, at the wall if possible. Unplug if you can. Don’t put something hot near something that can catch fire and keep drinks away from electrical equipment to avoid dangerous spills. In the kitchen, make sure cooking is never left unattended. Keep ovens and microwaves clean, as grease and dirt can cause fires. Toasters often set off the fire alarm unnecessarily so keep these on a low browning setting and regularly empty the crumb tray. Make sure appliances are regularly checked and serviced. Tumble dryers are a common source of fire, so clean the lint tray daily. Keep areas tidy, as dirt and dust on electrical equipment can cause it to overheat. Make sure your building is cleaned regularly. Keep in mind that It’s not just heaters and ovens that generate heat, electrical equipment does too. Ensure paper is placed or stored away from anything that generates heat. Don’t put clothes on heating devices. Avoid using tin foil on or near the bottom of the oven as this can ignite. Common sense is all you need for this one, if it’s something that gets hot, store anything flammable away from it. It’s also important to consider the possibility of arson. Install sprinkler systems where possible, and have CCTV as a deterrent. Don’t give intruders anything they can set fire to; keep rubbish locked away and inaccessible. Before leaving for the day, make sure your building is securely locked, and that all windows are closed. Flammable substances should be safely stored away from anything that can cause fire to spread, preferably in a locked cupboard. Don’t forget about the dangers of smoking. Keep the smoking area well away from the main building and provide a place for cigarettes to be thoroughly extinguished. Make sure your business has an up-to-date fire risk assessment. This includes a written record of potential sources of ignition, fuel and oxygen and how you can reduce or remove any risks. By keeping your risk assessment up-to-date, and running regular fire safety training, you can keep everyone informed and safe. Discussing the hot topics in fire safety.